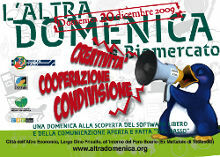 Sunday the 20th of december 2009, VDD will be guested at l'Altradomenica, an event dedicated to Open Communication and Free Software. It will be possible to put hands on it! The three themes of this edition of L'Altradomenica are creativity, cooperation and sharing. A presentation and a demo of VDD will be given within the SHARE space. In the FUN space, Internet Point Desktop-as-a-Service! Choose your distro and go! Come and see VDD at work at Città dell'Altra Economia, Largo Dino Frisullo - Foro Boario - ex mattatoio a Testaccio - Roma.